A new frontier for the Daring Bakers opened up this month with a vegan and/or gluten free challenge. 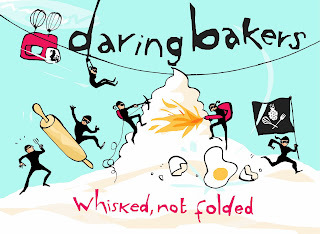 Two Alternative Daring Bakers : Natalie from Gluten A Go Go and Shel of Musings From the Fishbowl are hosting this challenge. And with great delight I found that the challenge this month was savory. The aim was to make Lavash Crackers from Peter Reinhart's The Bread Baker's Apprentice (pp 178 - 180). 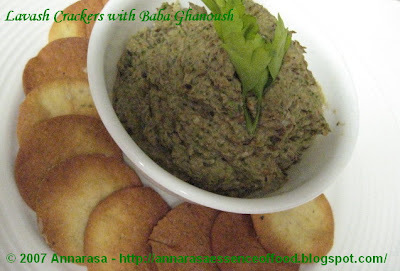 The Challenge: From Natalie & ShelMake Lavash Crackers and create a dip/spread/salsa/relish to accompany it. This challenge allows for large helpings of creativity and personality, with the crackers, your flavor choices for the crackers, and with your dip/spread choice. You can create your own dip/spread recipe, use one of your favorites, or use one of the recipes we’ve provided at the bottom of this post. Get crazy ! Just be sure to post the recipe along with your challenge crackers so we can see what you made and how you made it (so we can try it, too!). relishes/salsas must be vegan and gluten free. * You can do so much to make this recipe your own – adding dried herbs or roasted garlic, etc., to the dough, using gourmet spices-salts-seasonings-seeds to sprinkle on top, etc. * Read carefully ! The following recipe includes directions for both gluten-free crackers (à la Natalie !) and traditional AP flour crackers. * The key to crispy crackers is rolling out the dough as thinly as possible. We noticed that the crackers turned out better if you divide the dough in half before rolling. You’ll roll out the dough as per the directions, decorate and cook the crackers in two batches. RECIPE - Recipe Reference: The Bread Baker's Apprentice: Mastering The Art of Extraordinary Bread, by Peter Reinhart. Ten Speed Press, Berkeley, CA. Copyright 2001. ISBN-10: 1-58008-268-8, ISBN-13: 978-158008-268-6. Method:1. In a mixing bowl, stir together the flour, salt yeast, agave, oil, and just enough water to bring everything together into a ball. You may not need the full 1/2 cup + 2 tbsp of water, but be prepared to use it all if needed. 2. For Non Gluten Free Cracker Dough: Sprinkle some flour on the counter and transfer the dough to the counter. Knead for about 10 minutes, or until the ingredients are evenly distributed. The dough should pass the windowpane test and register 77 degrees to 81 degrees Fahrenheit. The dough should be firmer than French bread dough, but not quite as firm as bagel dough (what I call medium-firm dough), satiny to the touch, not tacky, and supple enough to stretch when pulled. Lightly oil a bowl and transfer the dough to the bowl, rolling it around to coat it with oil. Cover the bowl with plastic wrap. What I Did:I chose to make the non-gluten free crackers. I prepared the dough and then divided it into 2 parts. In one I mixed some onion seeds and in the other Italian herbs. I baked the onion seeds dough in sheets and the one with the herbs I cut into circles. The crackers came out really crisp and crunchy. They were very tasty and also very light as munchies. I served mine with home-made Baba Ghanoush (recipe to follow). All in all, this recipe is a keeper.Though it really is an effort to roll the dough out to the requisite thin-ness, the results are well worth it!! A great challenge as aparna said...daring bakers are really cool people! Beautful photos. I have to figure out how to put a title on my pics. I love baba ghanouj! Isn't it liberating to make ones favorite foods instead of having to purchase them? Beautiful everything! Love the baba ghanouj!